Come picnic to the music of the Boston Percussion Group this Friday, July 25th, 6-8pm! Traditional African music meets contemporary percussion ensemble repertoire in this eclectic program, including covers of popular hits from Jackson 5, ABBA, Chick Corea, Journey, Sufjan Stevens, and more! 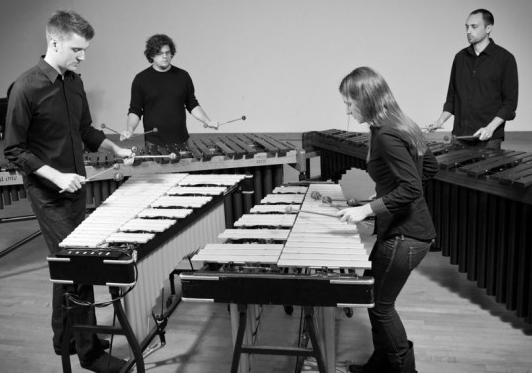 The Boston Percussion Group (BPeG) is a versatile chamber group that challenges what “classical” music is with the use of marimbas, drums, cymbals, tin cans, cowbells, and more. The core musicians come from diverse backgrounds having performed with Sydney Symphony, Boston Modern Orchestra Project, Bang On A Can, Sound Icon, and Zeltsman Marimba Festival. BPeG has presented concerts at The Boston Conservatory, College of the Holy Cross, Community Music Center of Boston, Boston Arts Festival, Circle The City, and the Outside The Box festival. BPeG also performed in Jordan Hall as a finalist in the 2012 International Chamber Music Ensemble Competition. Event produced by Tori Cheah. Free! Bring a picnic! Foodtrucks, too: Jamaica Mi Hungry and Snowy Joey Ice Cream. All 2014 programs at Magazine Beach are sponsored by Sanofi, the Charles River Conservancy and Knucklebones. Mariale Dance Fusion performed newly choreographed pieces, including Spanish Harlem, Frozen, and A Bajo del Mar. Children and adults, too, delighted in the Latin dance program, which closed with a salsa lesson. Thank you to Cambridge Arts for bringing this Summer in the City performance to Magazine Beach. ← Lovers of the Riv, and Yoga and Dance at Magazine Beach, too!